Dark Chocolate Chips as desired. Preheat the oven to 350F. Mash the banana until thoroughly pureed in a large mixing bowl. Begin to add in all of the other ingredients with regular mixing. When finished mixing thoroughly, in a baking pan lined with parchment paper, pour in your mixture. I have very limited ingredients in my apartment here in Laos. I don’t have access to all the same spices/ingredients as I do at home in Canada. If I can find them here many are very pricey because they are imported. BUT there’s always a way to make things work with what you have! I was craving a granola/trail mix to top on my smoothies, yogurt, and to snack on throughout my work day. 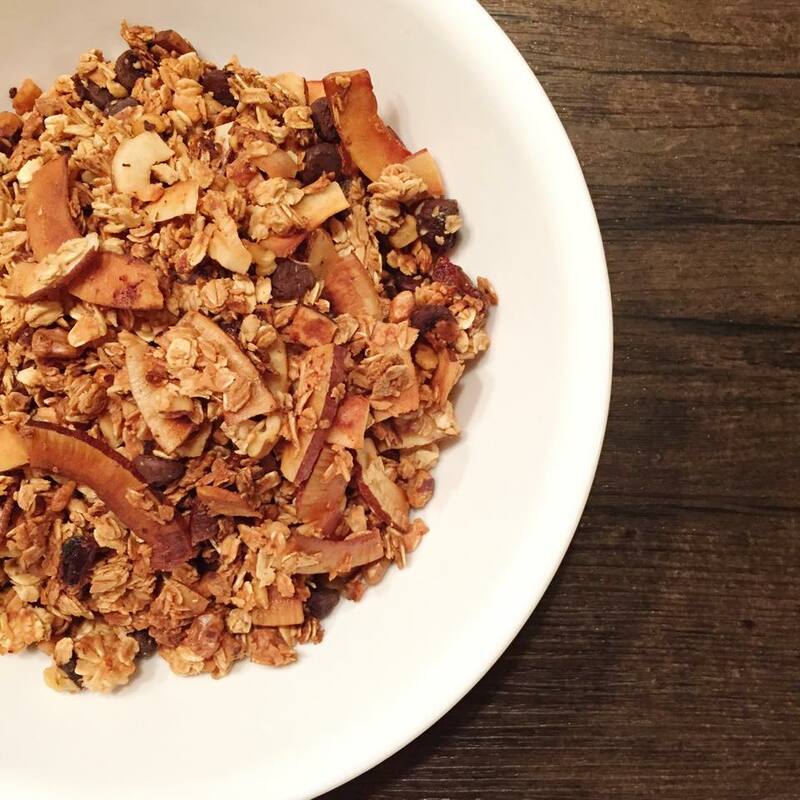 This granola mix is quick to make, free of any refined sugars, has no added oils/fats, and it is so tasty! My secret ingredient to adding the best flavour to this mix is David’s Tea!! 1.5 tbsp maple syrup, drizzled throughout. David’s Tea creates so many amazing tea flavours. Banana Nut Bread and Forever Nuts are my two favourite flavours at the moment and I packed them to bring with me to Laos. Their teas are always bursting with flavour. Sometimes when I am craving sweets I will just have a cup of tea. Banana Nut Bread and their Birthday Cake flavour are really good at putting those cravings to a stop! They are delicious. The Banana Nut Bread flavour contains small chunks of dates, banana, and almonds. It is delicious as a tea, to add to granola, or even cook it mixed into your morning oatmeal (so yummy). You won’t be disappointed. I was looking for a quick and easy granola recipe to make while at the cottage this weekend. We didn’t have very many baking ingredients up there… so I did as I could and this recipe turned out to be delicious! 1). Preheat the oven to 350F. 3). Place in the oven on a baking sheet in ‘clump’. 4). Put into the oven and let it bake until beginning to brown. 5). 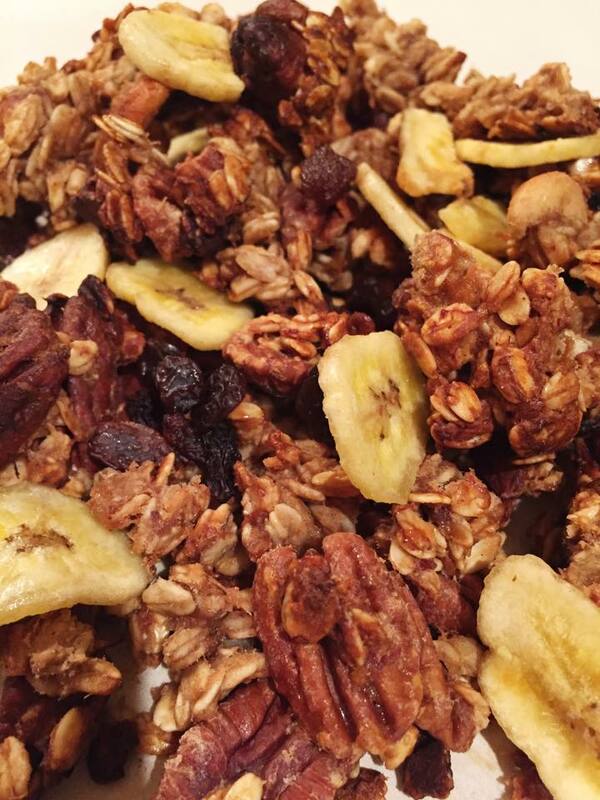 Mix the granola/spread it out on the baking sheet with a spatula. Mix every so often until all an even brown color (~20-25 minutes). 6). Remove and let cool. 7). Enjoy on its own for snacking, on yogurt, as a cereal, etc.